Pirates Of Archery • View topic - A few shots with the 67 Necedah. A few shots with the 67 Necedah. Haven't been out much (nasty bronchitis) but spent a little time in the back yard today. Re: A few shots with the 67 Necedah. Nice George, pretty good shooting too. I like those old bows....looks like a comfortable grip. I got one, not sure what year, but I like it. I picked up 3 "new" bows from the bay in the last few days. When they all get here I'll get some pics & stats. Watch that bronchitis, George. I had a bout of it once that I couldn't get over for nearly a year! Jack, it's a Shakespeare....Necedah is the model. 58", 45#, 1967. Cool. 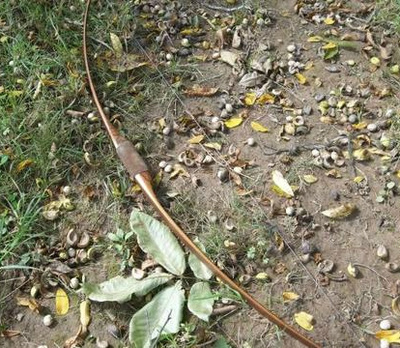 That bow sounded quiet. Just a nice little "whoosh" sound to it. I use bales too, cheaper than a block. That's a sweet 62 there friend. What is the weight? This one is a very quick shooter. 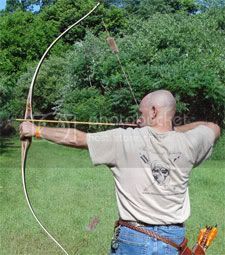 Those target/field bows had very long risers and short working limbs. This one's limbs is no longer than a Kodiak Magnum's limbs. They are virtually dead in the hand as well. Nothing to dislike at all. It's a primo hunting weight(for me) of 52#. He had it listed as a #52er in the title originally but must have edited it out. I blew up the pic to make sure of the weight and it is definitely 52. The Polars don't usually bring that high of a price. I would watch it closely. I'm betting you can get if for under $175.00. Wow George, very nice. That bow sure sounded quiet. Was it the video or is it really like that?